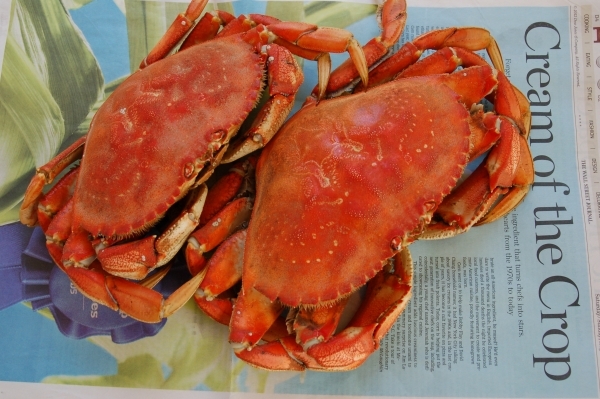 Dungeness Crab: Take this Crabby Quiz! Dungeness Crab from the Puget Sound. This post originally appeared on Amazon’s Al Dente blog on August 18, 2011. Dungeness Crab season is in full swing out here in the Puget Sound so I decided to pull this post from my archives and bring it back to life here on my new website. The links to the interactive WDFW quiz and the informative PDF brochure continue to work, so check them out. Here in Washington State, the Dungeness crabbing season is in full swing! The website also features a video and a useful informative downloadable PDF brochure. If you do go crabbing and manage to haul some home, be sure to have some crabby tools such as these on deck and at the ready! Previous Wild Blackberries are Ripe and Ready in Seattle!